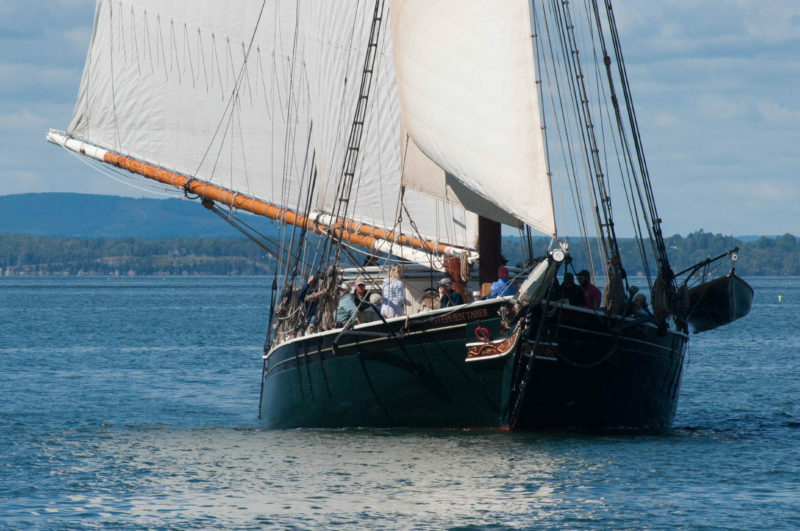 Maine Windjammer Blog – Interesting stories, events and random musings from Captain Barry King about windjammer cruises aboard the historic schooner Mary Day of Camden, Maine. Good morning! We hope you enjoyed your weekend. 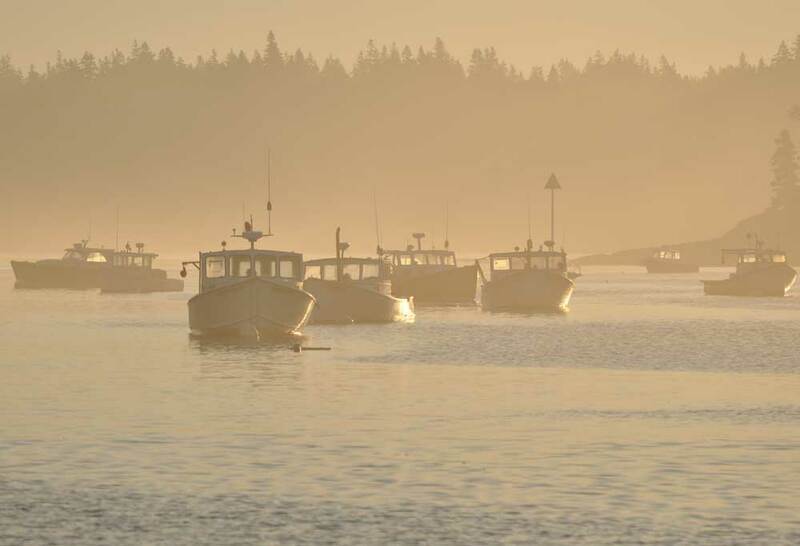 The weather continues to be absolutely gorgeous here in Maine. Isn’t that foliage incredible? Some ol’ colorful! The forecast says we are supposed to get some meaningful rain on Wednesday. We really need it. The swamp out back is drier than a boot. We have been scouting for deer and walking the property lines but haven’t scared up much. The coyotes have been quite close yippin’ away all night long which might account for the lack of deer at the moment. That…and the warm weather. Anyhoo…. 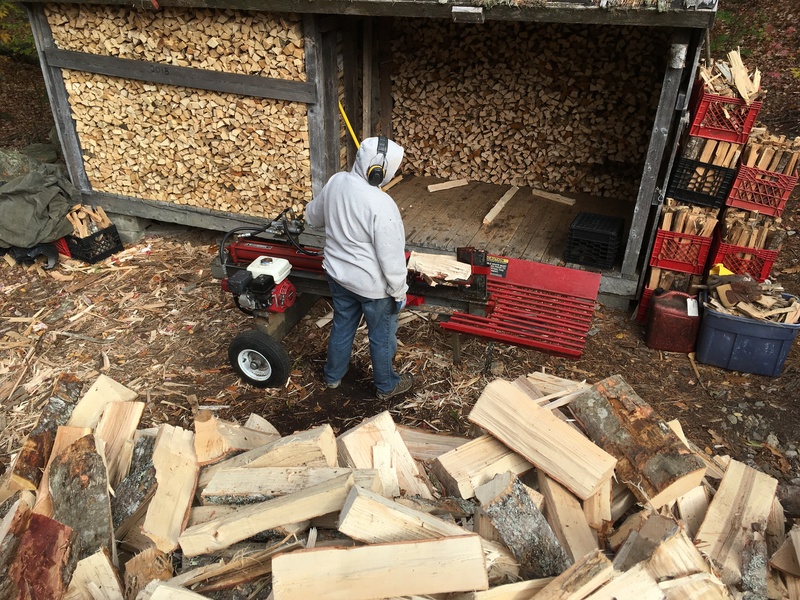 Maija and Jen have been splitting firewood to beat the band. Maija cranked out the better part of 3 cords early last week and Jen is out there splitting away as I write. I took a couple pictures and made a short movie so you could see a little bit of what it looks like around here. So remember this next summer when the wood stove gets lit at 4:30 in the morning and all that great food comes out of the galley! 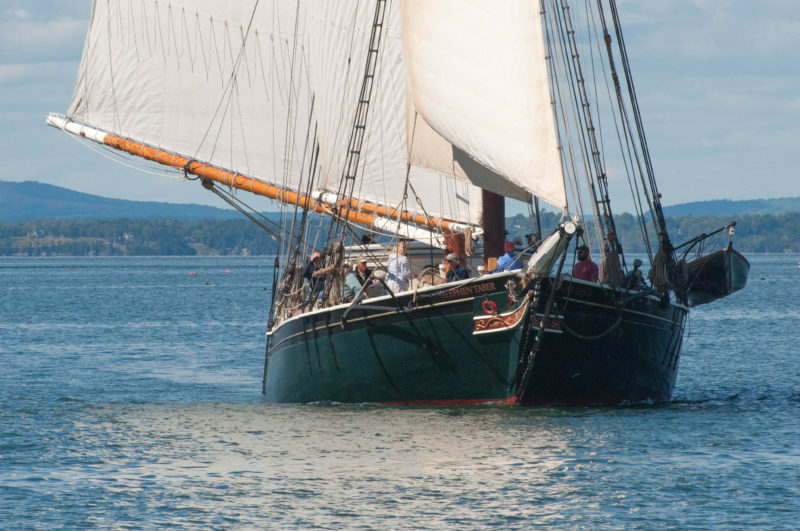 Posted in camden windjammer cruises sailing vacations, Windjammer Cruises in Maine on October 23, 2017 by Capt. Barry. 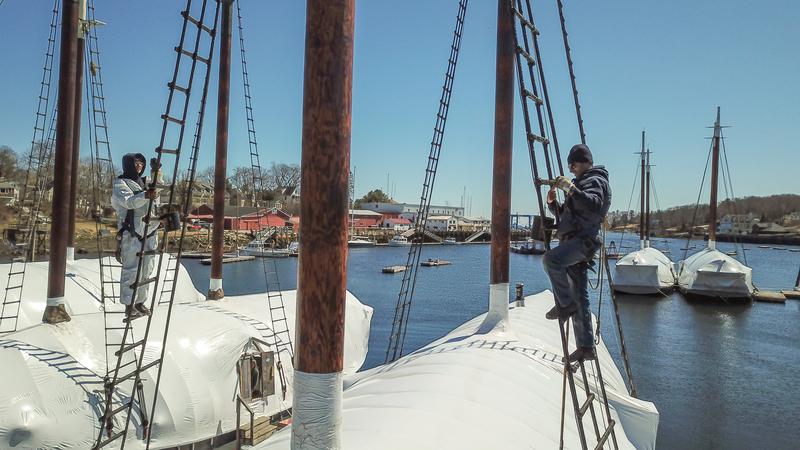 Caring for a schooner takes way more than ever meets the eye. 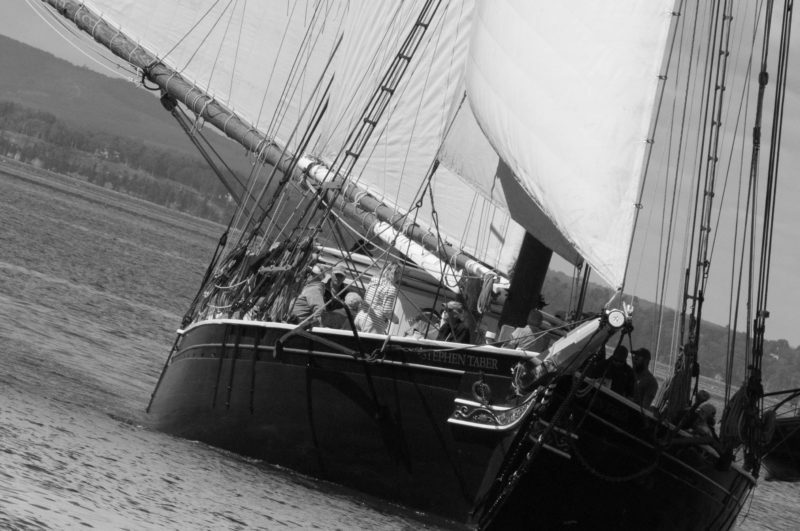 Schooners are built from wood (oak primarily in the case of Mary Day) and steel (or iron). 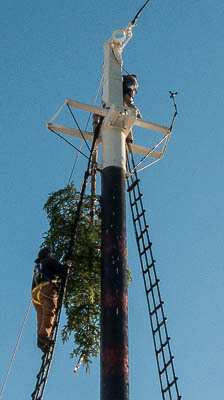 Mary Day has an 80′ long cast iron ballast keel bolted to the bottom of the wood keel with very large galvanized bolts. In the salt water environment these steel and iron bits get “eaten” up by what amounts to minute electrical currents created in a number of different ways. Preventing that “galvanic action” requires sacrificing “softer” kinds of metal to protect the keel and the keel fastenings. Zinc is a tried and true kind of metal that unselfishly sacrifices itself. Every year we bolt zincs onto the ballast keel and every year we have to renew them as they slowly get eaten away. Zincs aren’t cheap but then again neither are keel bolts. 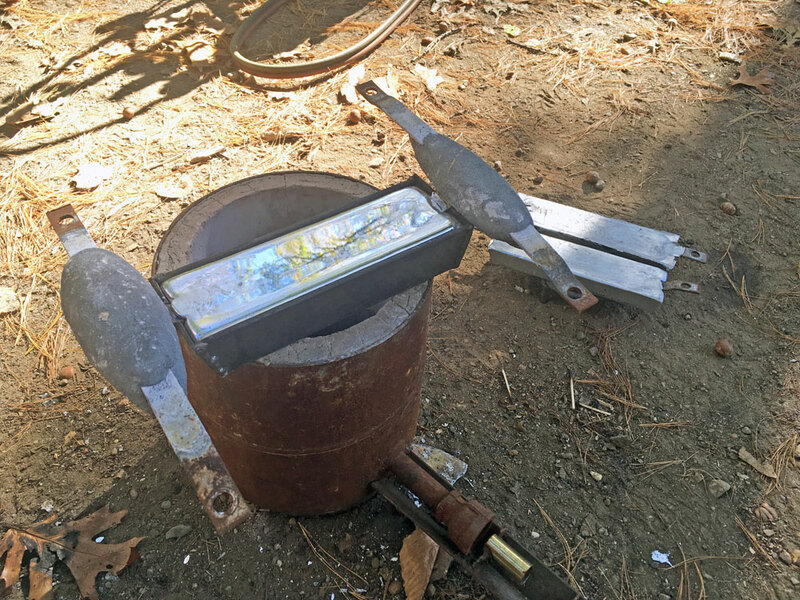 I spent yesterday creating a mold and melting down leftover zincs to pour some new ones by recycling leftover bits of zinc. This project was inspired by Captain Doug Lee who started doing this years ago with his forge at the North End Shipyard. I created the mold using 3″ channel stock. 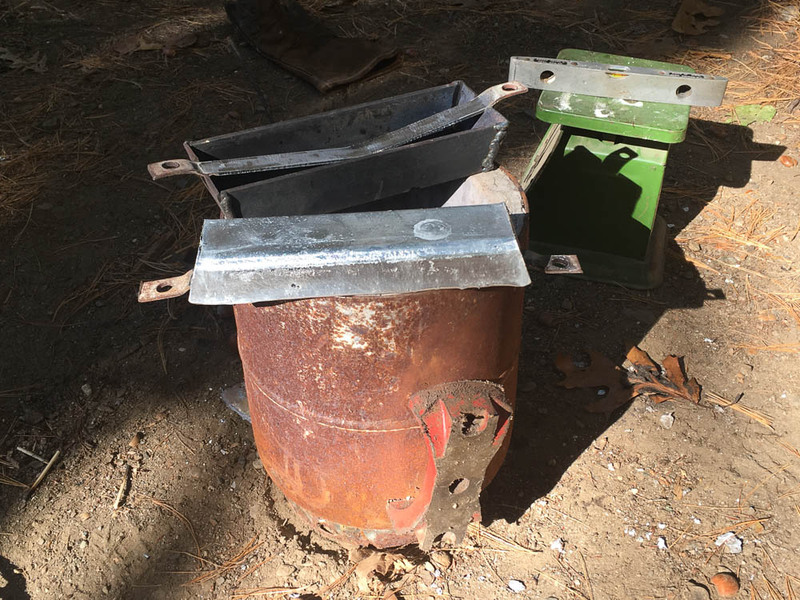 The ring burner worked quite well but I have improved on that by making a “smelter” using an old propane tank lined with concrete. You can see I use a cast iron teak kettle that makes pouring the molten zinc quite easy and accurate. In the second image you can see the mold and the finished product. The straps come from used zincs. The holes drilled in the straps fit bolt holes tapped into the cast iron ballast keel on the schooner. In the third image you can see the shiny molten zinc along with two old zincs that were formally bolted to the keel. Watch this video showing a little bit of the process. We must have 50+ of those used zincs that I have been holding onto for years knowing such an occasion would arrive. New zincs retail for $29/piece. We use 7 each season. That is $210….well more than the $14 cost of the propane used to melt the old zincs. These are the kinds of projects that keep me awake between midnight and 4 AM. Have a great day. And as always….be well. Do good! Posted in camden windjammer cruises sailing vacations on October 19, 2017 by Capt. Barry. Good morning everyone! Yesterday morning we took a walk in the woods to find the perfect tree to decorate the mast head of the schooner. We have a number of balsam firs in our woods most of which fit best in a Charlie Brown cartoon. After careful consideration we found one that, after careful trimming, fit the bill. We brought it down to the the harbor on a trailer and proceeded to string it with 250′ of white lights. Oh, don’t forget the bells at the tippity top. I have this image in my mind of someone standing on the town landing and hearing tinkling bells coming from the sky above. Santa must be close by! 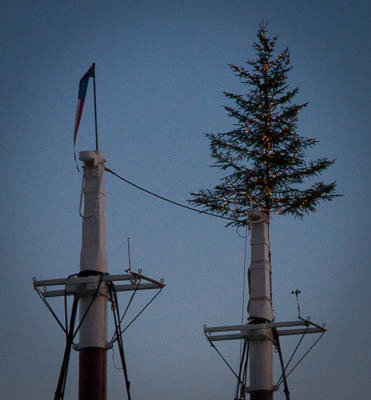 Rigging a 20′ tall tree at the masthead is not as simple as it might first appear. If I were a fly on a post watching from the town landing I would question the wisdom of sending a tree aloft upside down. But it really is the easiest way to get it off the dock and up aloft with do too much damage. Once the gantline attached to the “throat” of tree is two blocked a second line is used to right the tree. We use three stout seizings to lash the tree in place against the gale force winds that will undoubtedly whistle down through the Camden Hills at some time during the next month. As the light continues to fade for the next month we hope that everyone in Camden who sees the tree at the masthead all lit up will pause for just a moment and feel a little bit of joy for the season. We do!! Have yourself a great day. Be well. Do good. 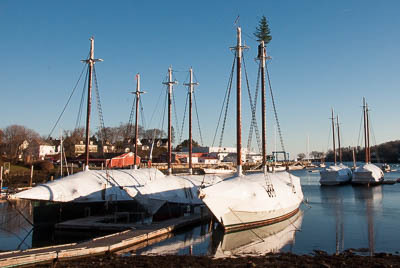 Posted in camden windjammer cruises sailing vacations and tagged Camden Harbor, Christmas by the Sea, Christmas tree, windjammer Christmas on November 29, 2016 by Capt. Barry. Good morning everyone. Finally we have received a little bit of meaningful rainfall here in Maine. This has been one of the driest summers I can remember so Monday’s rain felt quite welcome. I call Monday an “appreciation day.” After so many months without rain we could all appreciate a little moisture falling from the heavens. Since I seem to be on the “perspective” kick in recent blogs I thought I would throw one more in for good measure. (Probably not the last.) Last week we had the chance to visit and hike one of my most “favoritest” islands out on the edge of the bay. I don’t believe anyone has ever come back from that island the same as they arrived. 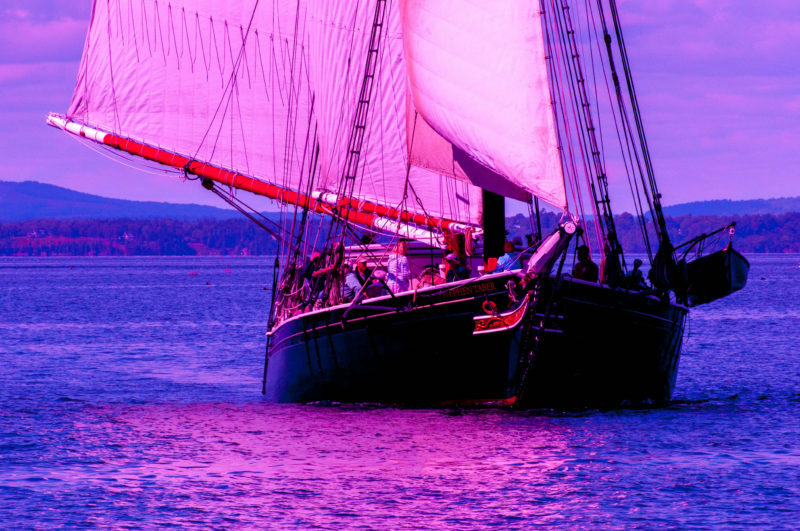 It is truly one of the highlights of sailing in Maine, viewing the bay from the top of an island that would better fit into the Shetlands than Penobscot Bay. To hold one of its soft storm tossed stones in your hand is to understand how time and tide work their magic. How can a rock be described as soft? I guess it takes about 400 million years to earn that distinction. Maybe people react the same way to the time and tides of our short life span? Boots please. It is getting deep around here. Anyhoo…. I certainly am in awe of any experience that helps me see myself a little more humbly and my world as a little more beautiful. That my friends is what we hope happens for guests on every cruise. Windjamming is a chance to gain a little perspective on the world from which we arrive. Maybe we go home a little softer on the outside, maybe a little more determined on the inside or maybe just a little bit more relaxed and rejuvenated from living to the rhythm of wind and tide. Posted in camden windjammer cruises sailing vacations on September 22, 2016 by Capt. Barry. 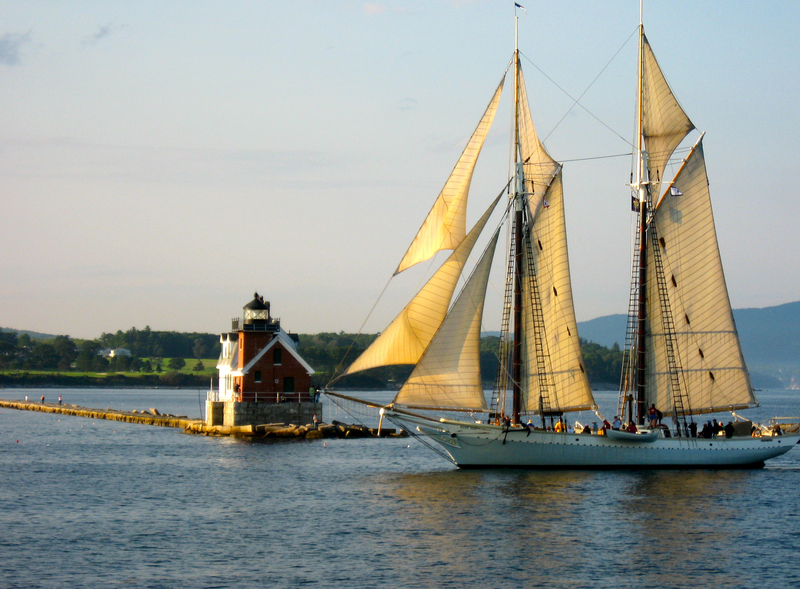 Pharologists Ted and Jo Panyatoff are back aboard so you can be certain we are seeing lighthouses this week. Yesterday we saw Curtis I Light, Indian I Light and the Rockland Breakwater Light before crossing the bay to the Fox Island Thorofare to see Browns Head Light and the “Spark Plug” at Goose Rocks. Most of this was in the fog so those lighthouses proved especially reassuring. We never did see the Owls Head Light. Conspicuously absent from several of those lights were their fog horns which the Coast Guard has taken one step further into obsolescence. The Coast Guard’s new MRASS system has been put into effect requiring the mariner to key the microphone on their VHF radio 5 times on channel 83A to start the horn sounding. I have yet to figure out why this was necessary but someone in the Coast Guard brain trust down in D.C. thought it was a good idea. I have always said that GPS chart plotters and VHF radios are one twenty five cent fuse away from quitting at any moment. Then what? We keep a 50 lb. sack of spuds on the foredeck just for such an occasion. 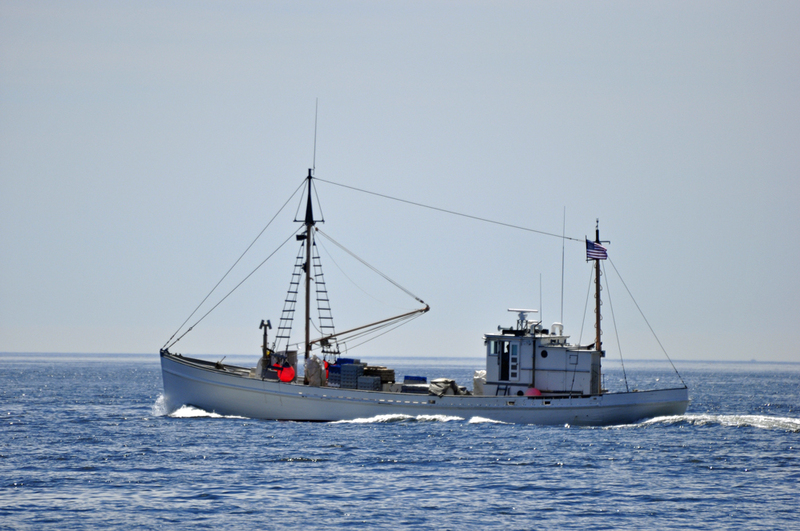 A deckhand with a strong arm and a well calibrated Aroostook Kennebec can sound the way ahead at least 100′. Plenty of time to hear whether the potato makes a splash or a thud. 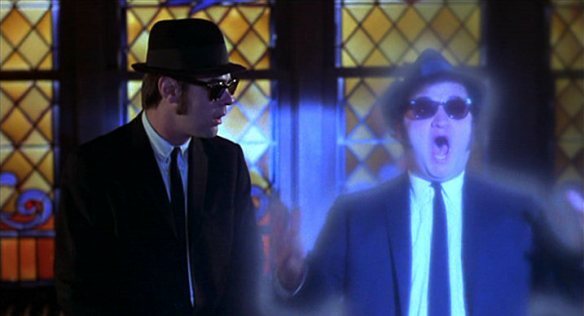 “Thud….ready about?” You get my point (if there is one). Sometimes the old tried and true is hard to beat. And that is why lighthouses are so important to keep alive. And besides that the preservation of lighthouses brings all kinds of people together and that kind of light is the finest kind. I hope you have a great day. Be well. Do good. Posted in camden windjammer cruises sailing vacations on September 8, 2016 by Capt. Barry. Good morning everyone. I think we will finally get some rain this afternoon and over the weekend that we need badly. I apologize to those who are here for a weekend getaway but the stream that our dogs like to wade in is all dried up making it very tough for them to cool off. A ground spider nest seen up close. Yesterday morning we awoke to a very thick fog. We could barely see any of the boats around us making it difficult to find shore. I knew the fog would burn off as the sunny blue skies overhead warmed the air temperature above the dew point. I have also learned to look for the signs that nature gives us. 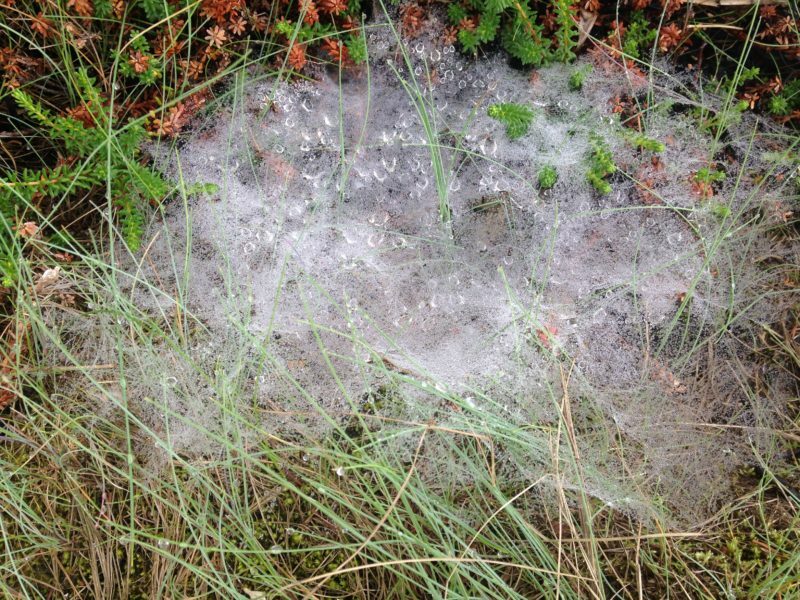 One of those signs are the ground spider nests and yesterday they were out in full force. People ask me questions all the time about this, that and the next thing. I can usually pull out (make up) an answer that sounds good out of somewhere. 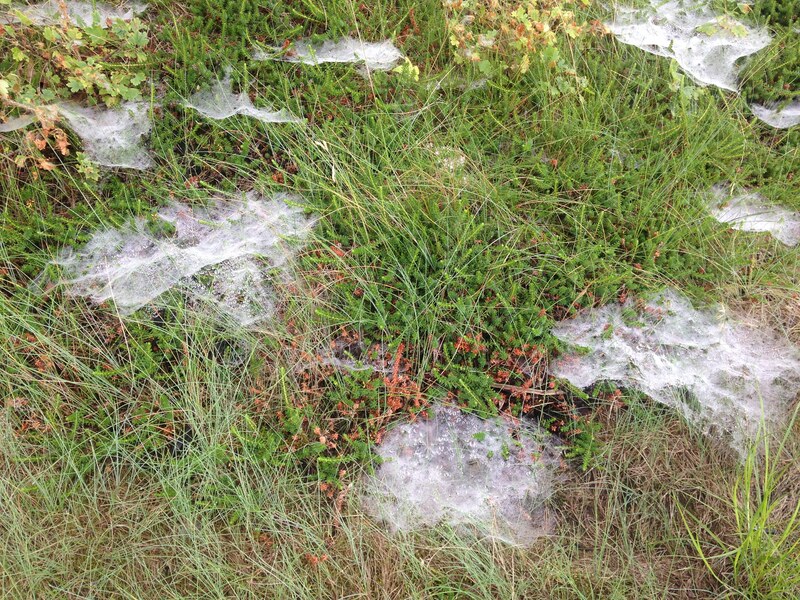 But why ground spider webs… I really don’t know. Does any one out there have any good wild a#@ guesses?? All I really know is that nature’s signs seldom fail me and that the Nile river pilots are often a great source of weather wisdom. “Fog at seven, gone by eleven,” they used to say. Well yesterday the fog didn’t actually clear until 1116. Fog on the Nile must behave a little differently. I hope you all have a great day. Be well. Do good. Posted in camden windjammer cruises sailing vacations on August 12, 2016 by Capt. Barry.